I recently bought some interesting yarn – it’s a radically different color depending on what sort of light it’s exposed to. I’ve seen this sort of yarn a couple of times from different dyers – it’s fascinating. I’d love to know how it’s done. Would you happen to know? This is wonderful stuff! It’s like the gemstone alexandrite, which is green in daylight, but changes to red under incandescant light. The way it works is that the coloring in an alexandrite stone absorbs light in the yellow range of the color spectrum–the color spectrum is the range of colors you see in a rainbow–while allowing you to see light in both the green part of the spectrum and the red part of the spectrum. If the original light that is shone on it contains more red light, like incandescent light bulbs or a candle flame, that that is the light that you see, whereas if the original light contains more green and blue light, such as sunlight or a halogen lightbulb, that is the color you see. The color in alexandrite is provided by small amounts of vanadium or chromium in the gemstone. The OttLite 3-in-1 Craft Lamp can be configured as a floor, table, or clamp lamp. The sleek, compact base is equipped with three arms that support a broad-shade lamp, an adjustable, hands-free, 5X optical-grade magnifier, and a clip for important papers. You can’t get this effect simply by dyeing with two different dyes, each of which reflects light in one of the two colors you want to see, because dyes, like paints, work in a subtractive way. If you apply a red dye to fabric, it works by absorbing the green light, so all you see is red, whereas if you apply a green dye, it works by absorbing the red light, so all you see is green. If you apply two different dyes, a green one which absorbs red light, and a red one which absorbs green light, the two colors are both subtracted from the light you see, which is why dyeing the same piece with both red and green dye results in a dark brown color. The only way you can produce the different colors under different lighting is to have both extremes of color reflecting from the same dye, and then compare the effects of a warmer light against those of a cooler light. 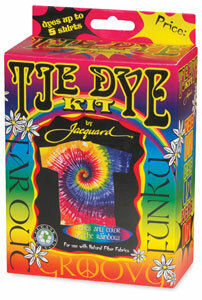 It’s simply a question of choosing a particular dye that absorbs in the correct parts of the color spectrum. There aren’t many dyes in common use that show this effect so strongly, and I’ve never seen them marketed for this property. Often the property of showing markedly different colors under different lights is considered a defect in a dye, because people want their ordinary clothes to be a predictable color. If you put on a red shirt under an incandescent light at home, you’re not expecting it to turn brown under the cooler fluorescent lights at work. When the special color property of the dye is remarked on at the time of sale, however, what is sometimes a defect instead becomes very desirable. It becomes something you can play with. I have observed this effect in a subtler form myself. I purchased some of a rather expensive Procion MX dye, red MX-G, also known as Colour Index Red 5, from George Weil in the UK. It is much closer to a true red than our usual red mixing primaries, which are red MX-5B (magenta) and red MX-8B (fuchsia), both of which reflect a large amount of blue light as well as red light. I was trying to decide if it was really a true red, or tilted slightly toward the orange or the blue side of red. It was impossible to decide. When I looked at fabric I had dyed with red MX-G, it seemed to be slightly orangish indoors, but slightly blue under the light of the sky. It was only a mild effect, though, not nearly as extreme as in the Mystical Moose series series of yarn. Red MX-G is not a popular Procion dye, by the way, because it is quite expensive, and yet a very similar color can be obtained much more economically by mixing red MX-5B (magenta) with orange MX-2R (strong orange). Now obviously all colors are somewhat affected by the color of the light you shine upon them. A dye or pigment has its color because it reflects only a limited portion of the visible spectrum of light, but if the light source contains a different balance of colors, the dye or pigment can’t show you any more light than it receives. Mostly our brains somehow manage to correct for the different colors of light, so that we usually notice the changes only in photography. Why haven’t we noticed the difference between the blue/red balance of a pure fuchsia dye under warm lights versus cool lights? It reflects both blue and red light, after all. The difference is there, but it is far less visible than that of the dramatic variations in the Mystical Moose series of dyed yarn. This entry was posted in about dyes, chemistry of dyeing on August 18, 2014 by pburch.